September 12, 2018: – Good News! 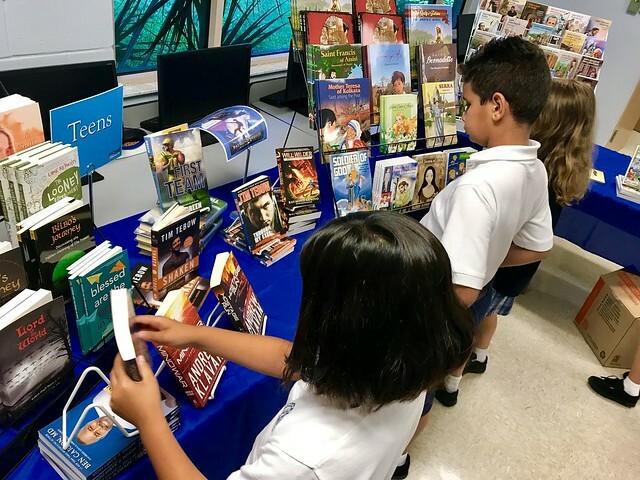 Book Fair launched its inaugural book fair in the Diocese of St. Petersburg in partnership with Notre Dame Catholic School in Spring Hill. The Good News! Book Fair took place during school days from September 6-12 and was open to students, parents and teachers of Notre Dame. Good News! Book Fair provides fun books, fiction and non-fiction, clean reads in multiple genres including Accelerated Reader titles, as well as music, games and other quality gift items through a week long school based book fair. They deliver hundreds of titles catering to students in Pre-K to 8th grade levels with selections for parents and teachers. Many are specifically faith based, true to our Catholic Christian faith and values.